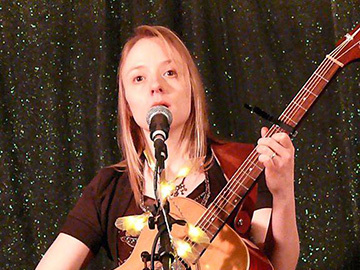 Originally from South Wales, Amy Goddard now lives in Portsmouth where she sings and plays regularly at local folk and acoustic clubs. She is a keen singer/songwriter and guitarist. She is also a guitar, piano and theory of music teacher. She co-wrote and released one CD with a friend and musical partner, Helen Harris, before circumstances dictated she continue alone. She has been pleased to receive much help and support from Igloo Music UK, a local music school and regularly performs at their events and is also a member of the Igloo Songwriting Choir.